QMEs founder and president, John Allen, tracked down Boadicea's captain, Bob Peel, while the boat was rounding Scotland, and asked him if the Koop OAS system had been as effective as he had heard. Peel replied that while it worked well enough he had not had much reason to use it. A few more questions were enough to persuade Allen, a skilled engineer in the hydraulics and stabilizer field, that he had found a promising and largely unexplored market. He set to work on developing new fin designs, quieter hydraulics and more efficient control technology for the production of QME-designed OAS systems to be installed in new builds. Allen was thoroughly familiar with Koop products, having been that companys exclusive North American distributor for several years, and he had long since identified limitations in Koop controls that required Quantum to make significant modifications to achieve optimal performance. When Boadicea was launched, Koop controls were more than a decade old, and in designing a new control for OAS Allen approached the man who invented the first one, Hans Ooms. Ooms agreed that the controls he made for Koop were outdated. He also told Allen that he planned to leave Delft University and form his own company in Holland to develop the next generation of software-based control systems. His work resulted in a family of controls under the ARC (Adaptive Ride Control) brand that is currently supplied by Quantum for conventional stabilizer systems, OAS and ride control systems. Allens only competition in the OAS business came from Vosper-Thorneycroft subsidiaries Naiad and KoopNautic (the latter acquired by Vosper in 1998); between them the three companies control 80 per cent of the world stabilizer market. As one of Europes oldest-established defense and civil contractors, the Vosper Group employs upwards of 7,000 and in its annual report for 2001 listed orders for $1.16 billion. Quantum, with a total staff of 25, had taken on a powerful rival. Having Hans Ooms aboard would help restore the balance. 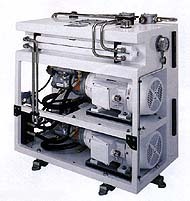 ~	It is generally true that the ultimate test of marine equipment, especially underwater equipment fitted outside the hull, such as stabilizer fins, is how it performs in service rather than on paper or in laboratories and water tanks. Manufacturers usually lack the firsthand experience of how their products function on a daily basis in all conditions. In researching this article, therefore, YIM sought information about the effectiveness of OAS systems chiefly from captains and engineers, since their main concern is the need for maximum efficiency of the ships equipment, not markets and profits. As of early March, 2002, there were two boats with Koop OAS systems installed: Amels 230 Boadicea, and the 194 Pegasus from Oceanco. Naiad/Koop have taken orders for nine more of their OAS systems, two of which are conversions in existing boats, the rest in new builds. These are all scheduled for delivery later this year and in 2003. Thus the Vosper subsidiaries had a total of two OAS systems in service and 11 pending. 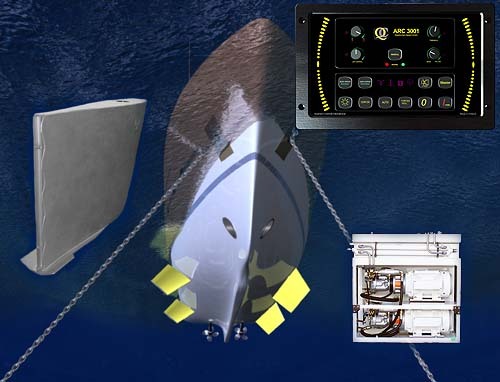 Quantum Marine Engineering has orders for OAS controls in 18 new builds in shipyards around the world, none of them yet in service. The company also reports that several prominent builders in Europe recently stated their intention to install Quantum OAS controls on future builds not already contracted to other suppliers. Available anecdotal evidence about the effectiveness of the Quantum system comes from the 10 yachts that have been retrofitted with OAS control, some of them with the Koop control as modified by Quantum, the majority with the control designed by Hans Ooms. NOTE: We have used the generic designation OAS (On Anchor Stability) to avoid repetition of the proprietary acronyms used by Naiad/KoopNautic (DATUM, Dynamic Adaptive Technology for Universal Motion control) and by Quantum (ARC, Adaptive Ride Control). See the "Yachts International"
Magazine Article in a 270K PDF Adobe Acrobat file.